Consumers are certainly getting vocal. 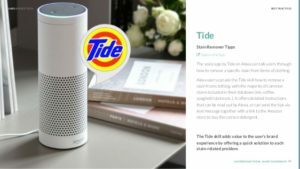 As shopping continues to evolve from brick-and-mortar stores to computers to smartphones and, now, to voice-activated devices like Amazon Echo, conversational commerce is gaining popularity due to its ease, allowing us to shop using just our voice. Consumers are embracing voice technology for efficient shopping activities, like creating shopping lists, receiving sales announcements, finding stores and product information, and placing orders. And retailers are paying close attention. To fuel market penetration of its voice technology, Amazon used last July’s Prime Day to offer $10 discounts and reduce the price of Echo devices by 50%. As a result, Echo devices sold at a rate of “thousands per minute,” seven times more than Prime Day 2016.5 Here’s why Amazon’s Alexa-driven Echo is on track to earn $10 billion by 2020: Consumers could install 128 million Echo devices by then, spending $400 per consumer per year on voice shopping.6 Voice is a lucrative, growing space. Navigating a new retail arena: CPG leaders like P&G create consumer-centric content to stand out with branded Alexa apps. Just as online search matters for visibility and e-commerce sales, suppliers need to consider how they can make their offerings one of the first or second recommended products to avoid getting buried in the emerging voice format. Dreams do come true: Amazon’s strategic partnerships for voice technology extend to other retailers, including Starbucks and Kohl’s, to make the customer experience faster and more convenient. One early adopter of voice-activated devices is David Pullara, a marketing expert. Pullara says, “I bought an Amazon Echo three years ago once it was introduced. 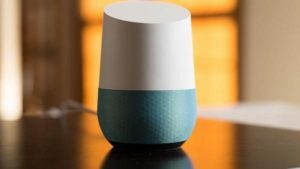 Today I have eight voice-activated devices throughout my home because they’re so useful.” In total, he has an Amazon Echo, an Amazon Echo Dot, two Google Home units and four Google Home Mini devices. Embedding tech into our lives: Consumers are increasingly comfortable with talking to our technology-at home and in public. Using voice technology to shop is the next step. Such consumer-centric ease and convenience are driving massive growth among voice-activated personal assistants and smart speakers, as consumers embrace retail-on-demand using the power of their voice. Retail companies need to stay on top of voice-related trends for opportunities to boost their visibility and sales and improve the omnichannel shopping experience by letting consumers truly feel heard. Do you have a voice-activated device? If so, have you used it to shop? 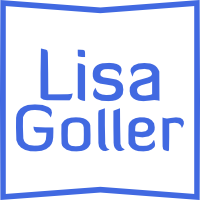 Lisa Goller is a marketing and communications professional with over 15 years of experience serving B2B, tech and retail companies. She helps businesses tell their story through irresistible content marketing and strategic communications. 1. ↑ O’Shea, Dan. Grocers bring voice-assisted ordering to the store. Retail Dive. September 21, 2017. 2. ↑ Jones, Charisse. Alexa, I need … everything. Voice shopping sales could reach $40 billion by 2022. USA Today. February 28, 2018. 3, 14. ↑ O’Shea, Dan. Grocers bring voice-assisted ordering to the store. Retail Dive. September 21, 2017. 4, 13, 17. ↑ Chaudhuri, Saabira and Share Terlep. The Next Big Threat to Consumer Brands (Yes, Amazon’s Behind It). The Wall Street Journal. February 27, 2018. 5. ↑ Mroz, Bart. Voice Shopping Gets Real as Major Players Ramp Up the Competition. Multichannel Merchant. October 2, 2017. 6, 12, 16. ↑ Ibid. 7. ↑ Levy, Ari. Bezos says Amazon will ‘double down’ on Alexa after blowing past projections. CNBC. February 1, 2018. 8. ↑ Chaudhuri, Saabira and Share Terlep. The Next Big Threat to Consumer Brands (Yes, Amazon’s Behind It). The Wall Street Journal. February 27, 2018. 9. ↑ Martin, Chuck. Online Grocery Shoppers Drawn To Smart Speakers. MediaPost. January 4, 2018. 10. ↑ Wallerton, Megan. You can now buy Amazon Alexa speakers at Whole Foods. CNET. November 9, 2017. 11. ↑ Pandolph, Stephanie. Walmart debuts voice shopping on the Google Home. Business Insider. October 6, 2017. 15. ↑ Koetsier, John. 22% Of Amazon Echo And Google Home Owners Shop By Voice; Sales Doubled In 2017.Forbes. January 9, 2018. 18. ↑ Thomas, Lauren. eBay CEO: Get used to shopping with your voice. CNBC. January 23, 2018. This entry was posted in *Lead Generation, Change Management, Content Marketing, CPG, Customer Experience, Industry Research, Marketing, Retail, Tech and tagged in Alexa, Amazon, Amazon Echo, Consumer, consumer goods, consumer packaged goods, content, content marketing, CPG, e-commerce, Echo device, Google Assistant, Google Home, hear, Lisa Goller, lisagoller.com, listen, marketing, mobile, online, private label, retail, shopper, shopping, smart speaker, speak, SuperBowl, tech, voice, voice tech, voice technology, Walmart.